Posted in: BSU Journal Club. Tagged: Pluto. At journal club today, we discussed a recent paper in Nature from Tanguy Bertrand and François Forget that looks at how the topography and meteorology of Pluto conspire to produce the dramatic frosts and glaciers seen on the surface of Pluto during the recent New Horizons fly-by. One of the most spectacular results from the fly-by was the discovery that Pluto has rugged mountain chains, enormous geographic basins, and flowing glaciers. The image below shows the evidence for glacial flow in Sputnik Planum, called the Heart of Pluto. 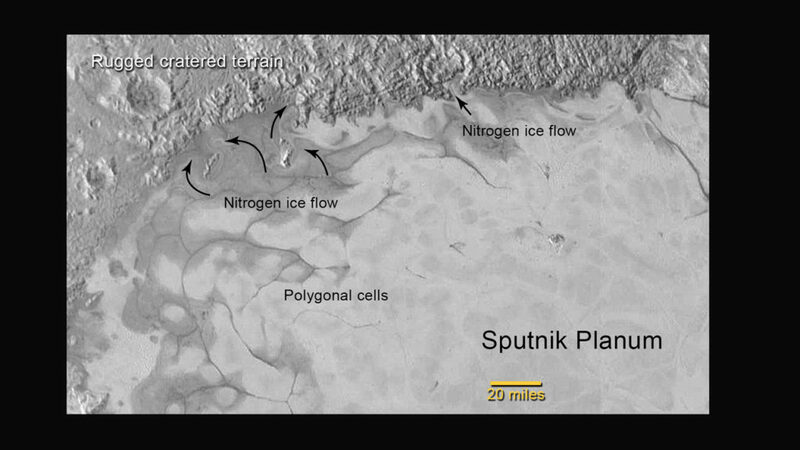 It had been suggested that the flowing nitrogen frost might have collected in Sputnik Planum from a source region connected to Pluto’s deep interior. However, coupling a sophisticated meteorological model to a model for vaporization and condensation, Bertrand and Forget show in their study that the gathering of frost in Sputnik is likely just due to the fact that it’s a deep basin, about 4 km below the Plutoid. As a result, the atmospheric pressure tends to be larger at the bottom of the basin than elsewhere on Pluto’s surface, which encourages frost deposition there. The authors point to a similar effect on Mars, where CO2 snows out preferentially at the south pole in Hellas Basin. It’s worth keeping in mind that the atmospheric pressure at Pluto’s surface is one one-hundred-thousandth the pressure at Earth’s surface, but even with a dwarf atmosphere, this dwarf planet exhibits complex and fascinating meteorological and geological phenomena. And just because it’s awesome, here’s a synthetic fly-over of Pluto’s surface, generated by the New Horizons mission.